'Chartier' (Charles H. Hall, 1925) IB. Midseason bloom. Color Code-WW. ( 'Windham' x unknown) x 'Wyomissing'. Diploïd. Homozygous recessive white (w1w1). From Longfield Iris Farm catalog, 1930: Chartier (Hall, 1925). 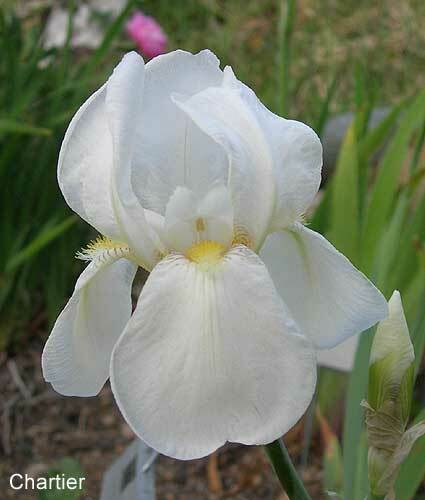 A smooth, clear white with wide, flat segments. The flowers are rather large and of very pleasing appearance; 32 inches. (Introducer's description) - $6.00. JPG chartier01.JPG manage 417 K 03 May 2018 - 21:57 Main.TLaurin Photo by Nancy McDonald-The Pickle Barrel Collection. JPG chartier02.JPG manage 508 K 03 May 2018 - 22:00 Main.TLaurin Photo by Nancy McDonald-The Pickle Barrel Collection. JPG chartier03.JPG manage 523 K 03 May 2018 - 22:01 Main.TLaurin Photo by Nancy McDonald-The Pickle Barrel Collection. JPG chartier04.JPG manage 484 K 03 May 2018 - 22:03 Main.TLaurin Photo by Nancy McDonald-The Pickle Barrel Collection. JPG chartier05.JPG manage 470 K 03 May 2018 - 22:05 Main.TLaurin Photo by Nancy McDonald-The Pickle Barrel Collection. JPG chartier06.JPG manage 471 K 03 May 2018 - 22:06 Main.TLaurin Photo by Nancy McDonald-The Pickle Barrel Collection. JPG chartier07.JPG manage 736 K 03 May 2018 - 22:08 Main.TLaurin Photo by Nancy McDonald-The Pickle Barrel Collection.